Benares From The Mundakinee Talao. bl.uk > Online Gallery Home	> Online exhibitions	> Asia, Pacific and Africa Collections	> Benares From The Mundakinee Talao. 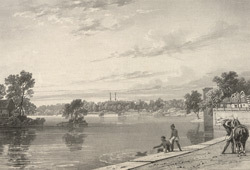 Plate 10 from the first part of James Prinsep's 'Benares Illustrated'. Prinsep (1799-1840), an antiquary and colonial administrator was assay master at the Benares Mint between 1820-30. The lithographs published in this collection were based on his original sketches of the various views of the 'holy' city of the Hindus. Of this view he writes: ' The Mundakinee forms one of a line of jheels or ponds, which divides the town nearly parallel to the river, and seen to have been formerly a back channel for the superfluous floods of the Ganges in the rainy season. By the construction of a tunnel drain under the town at Trilochun, these Tulaos were laid dry a few years ago, and the site of one of them is now converted into a grain market. The Mundakinee being stocked with turtles, which were looked upon with veneration, and regularly fed by the Hindoos, a merchant volunteered to pay two annas a head for all that should be removed alive into the river upon the drawing of the tank...The Sanskrit College occupies a disagreeable position on the right of the Tulao, close to the mouth of the main sewer. The mound on the left, with a cottage upon it, belongs to an order of religious mendicants'.